Well I'm sorry, but I'm going to have to talk about it again. This chocolate and ginger thing is almost all I can think about. I may very well be suffering some form of addiction. Not only have I been making several different kinds of chocolate gingerbread cookies for Christmas, it's beginning to affect other areas of my life. There I was, innocently mixing up a batch of baked oatmeal (what we eat daily for breakfast) just like I do every few days and all of a sudden I was possessed by some chocolate-ginger entity (Yes, I just watched the new Star Trek movie. And, yes, I'm a nerd. And, yes, the movie is awesome.) that forced me to reach into the cabinet and add a teaspoon of ginger, a 1/3 cup cocoa and a 1/2 cup of white chocolate chips to the oatmeal. To our breakfast! Me! Feeding our children chocolate baked oatmeal for breakfast! I was appalled at myself. I really was, well...I was until I tasted the warm, fresh-from-the-oven chocolate-ginger oatmeal. Then I became possessed all over again and searched through my archives until I found this recipe that I knew was in some magazine somewhere. So, go on. Go ahead and shake your head in disappointment. I probably would if I were you. Either that or prepare to become possessed yourself... come on in, the water is fine. The dough needs to chill a bit before rolling out. Whisk together ingredients flour through baking soda in a bowl and set aside. In the bowl of an electric mixer, cream butter and brown sugar until fluffy (about 4 minutes). Add egg, molasses, and bottled ginger, mixing until combined. Add flour mixture and beat until just incorporated. Refrigerate the dough for a couple of hours. 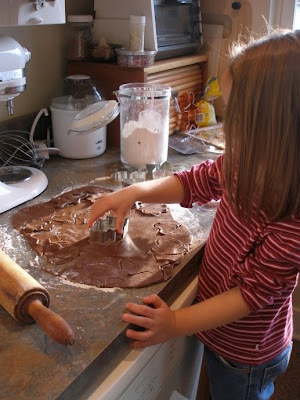 Or, if you wish to roll out cookies sooner, divide dough in half and place each half on a large sheet of plastic wrap. Cover it with wrap and press it until it is about an inch thick. Refrigerate the halves this way and you can chill them for just an hour. Flour your counter top and turn out the chilled dough. 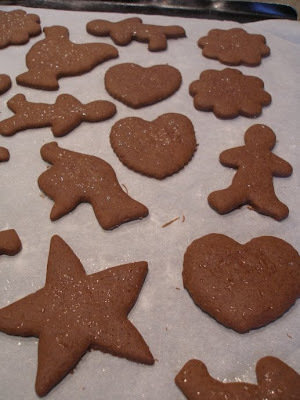 Roll the dough to 1/4 in thickness and cut out your cookies using a gingerbread man cookie cutter or any cutters you choose. If you find the dough is too sticky, add several tablespoons of flour to the dough and knead it until combined and try again. Repeat this until the dough is easier to work with. Place on cookie sheets lined with parchment paper or coated with cooking spray an inch apart. Sprinkle them with dusting sugar or edible glitter (I used glitter made from egg whites). Bake at 350 degrees for 8-10 minutes. If you can avoid over baking them, you'll be left with soft cookies. We are snowed in for the second day in a row. Yesterday my teenager baked 3 batches of cookies and made a lemon ginger pinwheel cookie as one of her experiments. She kept wanting to use ginger (must be contagious), so I'm going to show her this recipe to try today - another snow day! Have you ever made pepparkakor? It's my all time favorite swedish gingerbread cookie. (sorry no chocolate in it, but you could dip it in melted chocolate). Amy, I have never heard of pepparkakor. Would you share your recipe? Wait a minute. What? You mean it's wrong to have chocolate for breakfast? Oh great....now what?! ps...I love your blog header photo. Beautiful! Have you tried 101 Cookbook's latest recipe: chocolate-ginger cookies? And have you tried Molly's banana bread with crystallized ginger and chocolate chips? I'm thinking those two recipes might be right down your alley. JJ, I would LOVE to convert you. 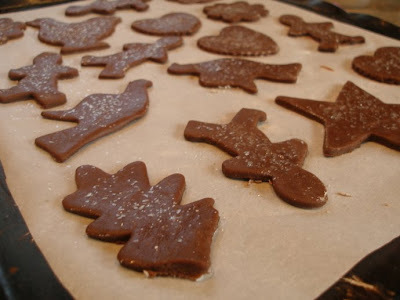 If you make anything, PLEASE try the Chewy Chocolate Gingerbread Cookies in my Recipe Index. If you don't love those, you might as well not try any other chocolate-ginger combo. I haven't tried the other two recipes you suggested- we don't use bananas and I have about four chocolate-ginger cookie recipes already:-)! So thursday we're meeting with another family to bake cookies/craft/play... I think a batch of gingerbread is in order. We made them last week, but we ate the photgraphable evidence too quickly. I make icing with powdered sugar & milk, use small baggies to make icing tubes. Jack came up with this, because 'that's how Nana does it'. Nana's the cookie pro! And I'm with Michelle, what? no choclate for breakfast? We've been binging on hot chocolate almost every morning since December rolled into town. Yum, on the dip into choclate with the pepperkakor! I'm sorry... what day did you say the fed ex package of cookies was arriving at my door?